I sat down to open my mail a few days ago and received what felt like a slap in the face. Shame hurts. My local utility company sent me a report letting me know that I was using 161 percent more electricity than my neighbors. 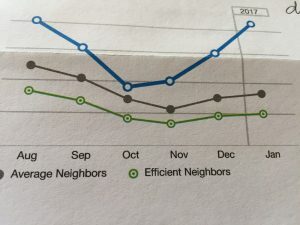 The utility shared this information in three different wa ys: in the percentage noted to the left, in a chart comparing my overuse to my “average” and “efficient” neighbors, and in dollar terms. Evidentially, I’ve spent $433 more in the last six months on electricity than my “efficient” neighbors. Wow! I let a lot of things go, but this wasn’t going to be one of them. I’m sure it is an automatically generated report that goes to everyone, but I wish the company had checked its records. I’m on file as being on oxygen 24/7, and am on a priority list of customers to get power restored quickly whenever there’s a power outage. It struck me that the utility is using the age-old strategy of shame to try to change my behavior. 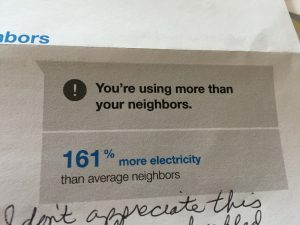 If the company can make me feel bad enough for using too much electricity, and compare me to my neighbors who are “good,” maybe I’ll mend my ways. This notice didn’t hurt me, or cause me to feel guilty for using more electricity than my neighbors who breathe just fine, and go to work during the day. I thought it was ridiculous, and it made me angry. 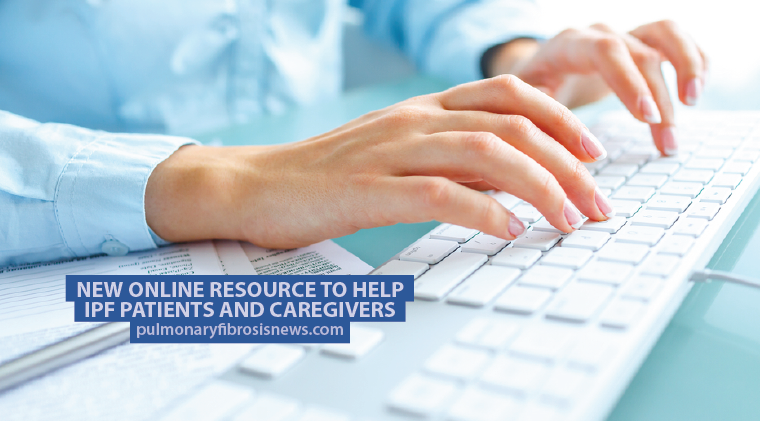 It’s hard enough cope with all that goes into living with pulmonary fibrosis without having to deal with unnecessary pain and hassle. The reality is we are all doing the very best we can. I took these pictures to show my husband, and later decided to write a blog post about it. No doubt you’ve received shame or blame in some ways for your disease, or the needs you have because of it. If you are nodding “yes” I want you to know I’m so sorry this has happened to you. It is hard to get a message filled with shame from someone, especially when it is out of the blue. It can hit deeply, especially if you are feeling vulnerable and it’s unexpected. Sometimes people (or electricity companies) say or do things out of ignorance. It still hurts, but not as much as when those comments are made intentionally to hurt you. In the case of this letter, I’m sure no one thought how it would hurt someone in my situation. For all I know, the company may they think I’m growing “weed” in my back bedroom and using lots of electricity! That’s why I decided to send a response. I went out to my car and had a good cry. I’d love to hear from you, and hear about your experiences. What type of shaming messages have you gotten about your disease? How do you cope with these messages and care for yourself? Please share this post with anyone you feel could benefit, or on social media. Tagged copng with pulmonary fibrosis, interstitial lung disease, living with IPF, pulmonary fibrosis, shame. Yeah, I’ve had people move away from me in movie theaters because of the little “pssst” noise from my portable O2 concentrator. A couple weeks ago my wife and I were in a theater while the pre-show ads were showing. A woman a couple rows in front of us turned around and said, “What’s that noise?”. My wife explained that it was my oxygen. A minute later she got up and moved a few rows away (there were only 6 of us in the large room). It’s happened a few times. You can’t even hear it when the previews and movie start. Hi Steve…I’ve had that happen at the theater too. The first time it was such a shock and felt so bad. You are right, you can’t hear it once the movie starts. I still enjoy going to the theaters because it is one of the few normal things I can still use while using supplemental oxygen. So sorry that’s happened to you several times. Just keep going! I will too my friend. When I go to see a movie and people don’t like, the fact I have oxygen, well I give them the one finger salute. Life is too short specially for people like us with this terminal illness. I got the same notice. Read it. Laughed at it and tore it up. 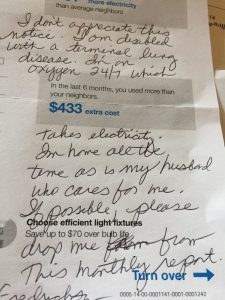 I sent them a nice but angry email explaining that it was bad enough our bill increased substantially once my husband started using not one, but two oxygen concentrators 24/7, and that we didn’t appreciate receiving both an email and a snail mail reminding us of just how much electricity we use …..especially since they refused to offer us some kind of discount. And my husband is also listed with them as using supplemental life-sustaining oxygen in case of power outages. When I get notices from the electric company shaming me about my electric usage, I just don’t care. I try to live my life to the fullest among my family and friends. Negative things that won’t help my condition, I tend to ignore and discard. Kim I am experiencing the same thing with National Grid. I have a 10k Solar system on my home and I am in the SMART user program. I was a part time oxygen user. In November I was placed on oxygen 24/7. I live in Massachusetts so in the months of Nov.-March the solar only helps a little. My Bill this month was $243. Last year without the concentrator running my winter bill never exceeded $100. Hi John, so sorry you are dealing with this too. How wonderful that you are so active in saving energy wherever you can. It does take a lot of energy to keep our oxygen concentrators going. I appreciate you sharing your experience with us. Blessings to you. Well that explains why my electric bill runs so much higher than my neighbors! I have my concentrator on 24/7 even when I leave the house, so it will be ready when I get home. I guess I will be turning it off now! Geoffrey…what a horrible experience! I’m so glad you are living in NC now, and that your costs are cut in half. It’s hard to grasp how much we go through just to have oxygen to breathe and stay alive. Thanks so much for sharing your experience with us. When my husband was on Oxygen of course our bill went up and the stupid notice showed us to be greedy consumers of electricity. As for the “Help” from the electric company in case of a power outage we were told to go to the local hospital emergency room! Big fat help that would have been if the power had gone out during a blizzard. They do not care at all. Fortunately the longest outage we had was just a couple of hours and we had a back-up portable canister. Yes I just called my local Energy company and gave them a piece of my mind and they are removing me from the list , so I will never got one of these stupid notices again. 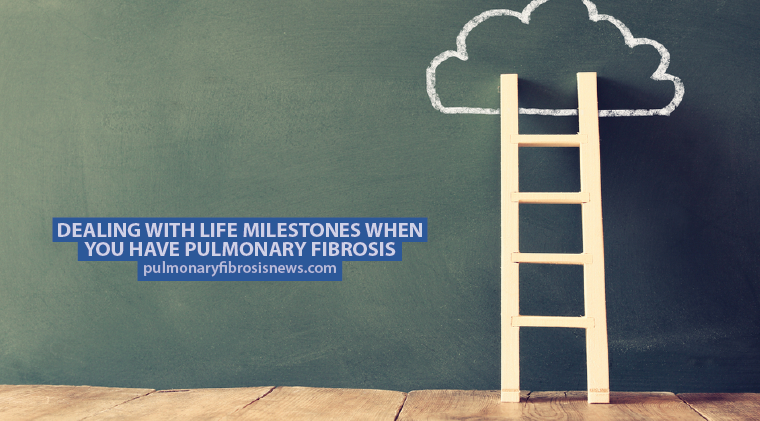 I have IPF and as you know we are supposed to avoid stress at all costs , so thank you for sharing your article , there’s so many situations PF Warriors find themselves in that unnecessary, so this in one less hassle..
Way to go Mike! The more of us who weigh in with our electric companies the better. Great to hear from you!